Q: What does “knowing my numbers” have to do with heart disease? A: We all have our numbers, like cholesterol levels, blood pressure, weight, and blood sugar. Those numbers can tell an important story about your risk for heart disease. Heart disease is any disorder of the heart muscle, valves, rhythm or blood flow to the heart. Today in the U.S., heart disease is the number one cause of death among both men and women. So knowing your numbers is an important part of your health story. It’s also the first step to reducing your risk of heart disease. Q: Isn’t heart disease something out of our control – you get it or you don’t? A: There are two types of risk factors: things you can’t control and things you can. The things you can’t control are your genes: they may predispose you for high blood pressure, high cholesterol or diabetes. If you have a family history of these health conditions, you may be at greater risk for heart disease. However, there are things you can control, including blood pressure, blood sugar, your weight, cholesterol levels, and smoking. Getting them under control reduces your risk of heart disease. In fact, lifestyle changes can reduce your risk up to 60 percent – and that’s without medication! Q: What changes should I make? Quit smoking. For people who quit, their risk of heart attack falls to the same level as nonsmokers in just two years. Improve cholesterol levels. Cholesterol in your blood includes LDL (bad) cholesterol, HDL (good) cholesterol and triglycerides. A healthy diet and exercise are key to managing cholesterol, though some people may also need medicine. Get active. Just 30 minutes of exercise four to five times a week can reduce your risk for heart disease by 30 percent. Exercise reduces your blood pressure and blood sugar. It also helps control your weight and lowers your cholesterol levels. Control high blood pressure. Exercise and healthy eating, as well as avoiding salt, are keys to controlling blood pressure, but some people may also need medicine. Follow a heart-healthy diet. Eat more foods that are low in fat and cholesterol, including fruits, vegetables, whole grains, beans, nuts and legumes. These foods are high in fiber, which is good for healthy cholesterol, and contain many nutrients. Eat lean meats, poultry and fish (especially salmon or tuna, which are high in omega-3 fatty acids). And – very important – reduce your intake of salt and sugar. Get to a healthy weight. Losing extra weight is good for your heart and can help lower high blood pressure and manage diabetes. Control diabetes. Many people who have diabetes don’t know it, so get tested and treated. Manage stress and anger. Everyone has stress and anger sometimes, but if it happens a lot, it can damage your heart. Managing stress and handling anger in healthy ways makes you and your heart feel better. See your doctor to learn what your numbers are, and how they impact your heart health. Your physician can also help you make healthy lifestyle changes and manage your risk factors. Knowing your numbers and getting them under control can help the story of your heart be a long and happy one – for you and your family. 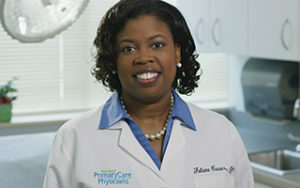 Dr. Carter is an MPCP partner and is certified by the American Board of Family Physicians. She sees patients at the Arundel Mills office.